khatam karee means "hand-inlaid." To inlay is to apply wood or other materials in geometric shapes to decorate the surface of various objects. The average is 250 pieces for every cubic centimeter of inlaid work. 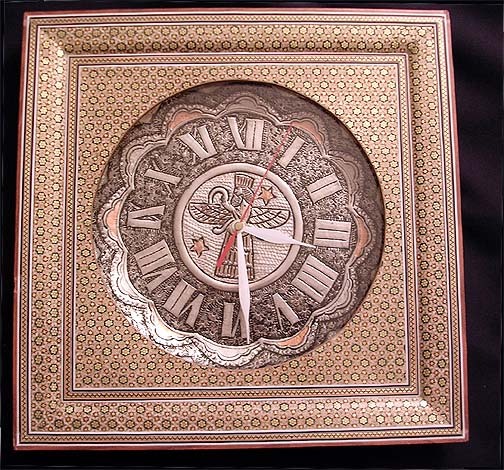 The clock face is of metal and features a hand-crafted design. 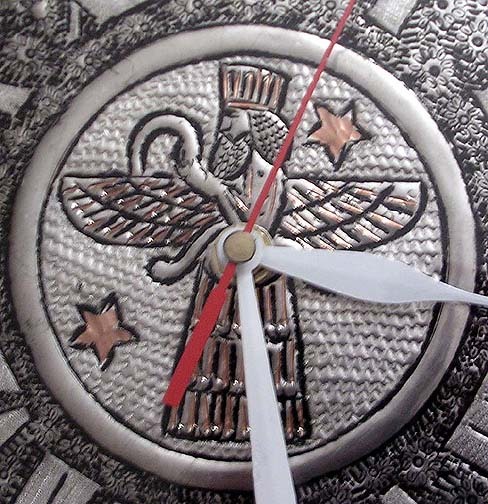 A man's upper body with wings is the Faravahar (farohar), the traditional symbol of the ancient Persian religion of Zoroastrianism. Comes with a wooden backing and a metal clasp at the top, ready to display on your wall. Great for home or the office. Dimensions: 13.5" (34 cm) square.